It was the Giro that made Austin Walsh do it. ‘Do what?’ I hear you ask. 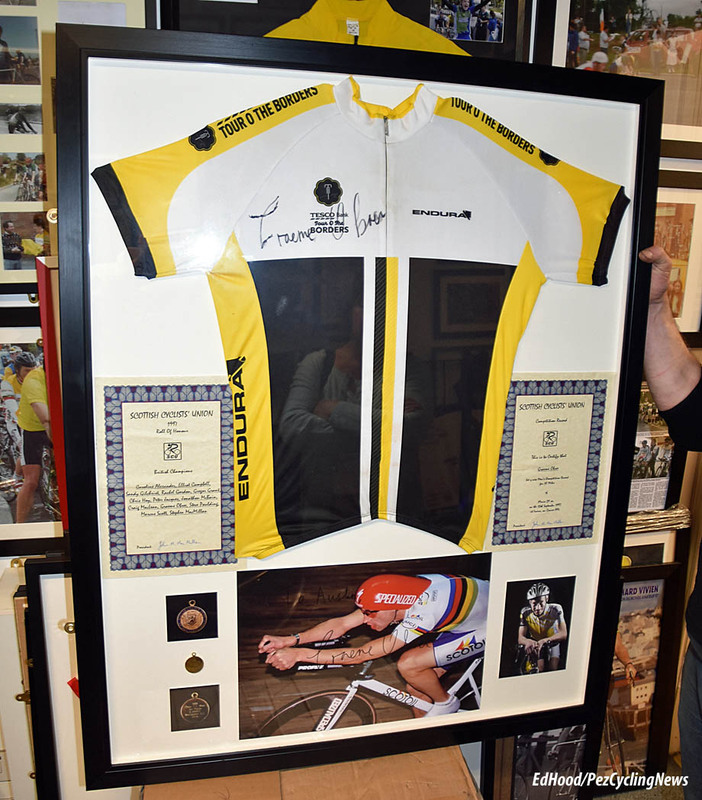 Invest so much time and money into his collection of cycling memorabilia which now threatens to overwhelm his bike shop. 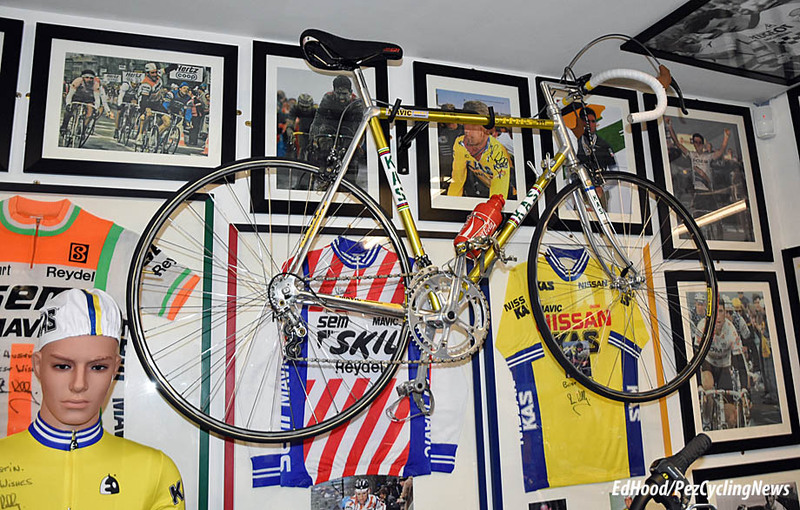 The Italian race started on the Emerald Isle in 2014 and Austin was so smitten by ‘The Pink Race’ that he decided to turn the bike shop, which he’s run since 1995, into a bike racing shrine. Austin raced in England with Manchester Wheelers and in Brittany for several seasons so he’s no ‘Rapha/sportive/hipster’ Johnny-come-lately to the sport. 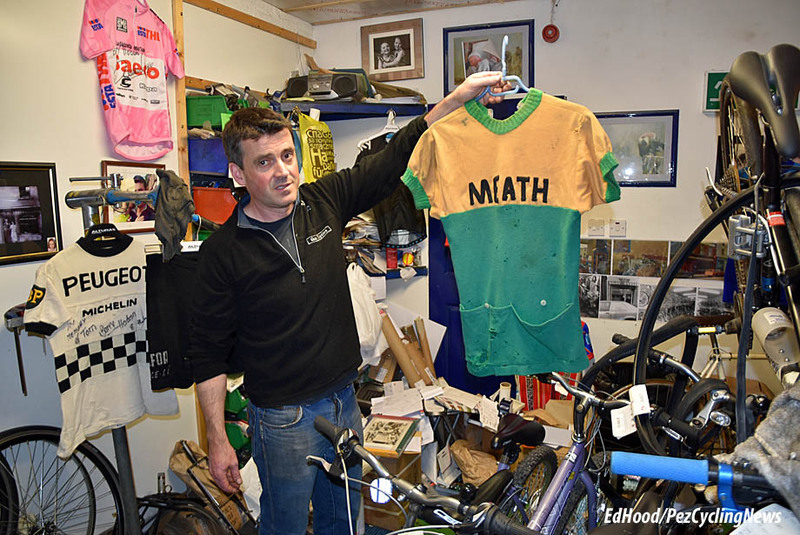 Since that Giro his collection has grown and now every nook and cranny of Quay Cycles in Drogheda – a bustling dormitory town to the north of Dublin – contains a picture, jersey, bicycle or piece of one which makes people like me peer at it and demand to know the provenance. Where to start? 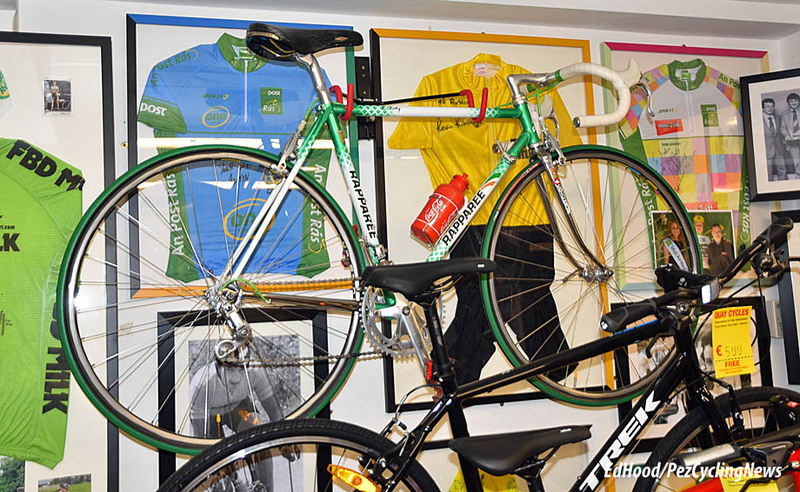 As you enter the shop, on the left there’s a glass display case dedicated to the man, who well before Sam Bennett and even Sean Kelly and Stephen Roche were lighting up the roads of Europe. The first English speaker to win Het Volk, 1959; the first English speaker to win a stage in the Vuelta and to wear the amarillo jersey of race leadership, finishing an eventual third overall, 1962; the first English speaker to win a Giro stage, 1960; the first English speaker to hold the yellow jersey of race leadership in the Le Tour, 1963 (the first stage winner was Yorkshire’s Brian Robinson in 1958) and the first English speaker to stand on the podium of the World Professional Road Race Championship, 1962. The late, great, Shay Elliott, rest in peace. 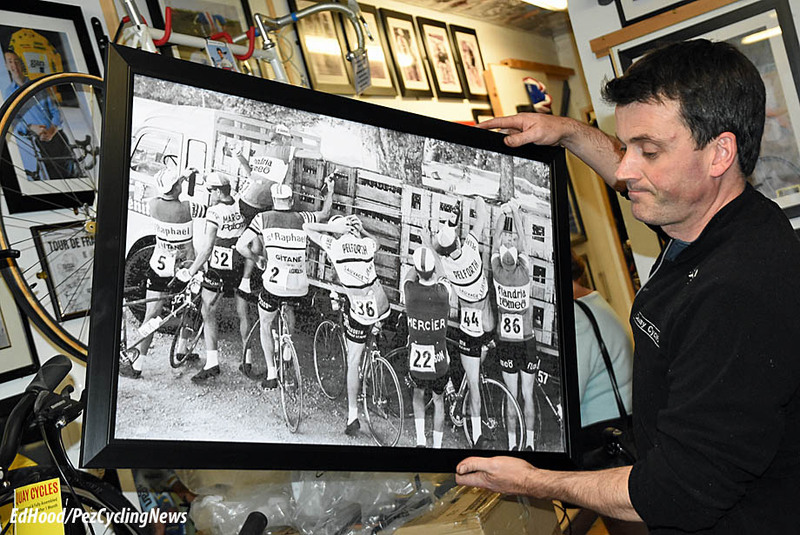 Photographing glass cases for an amateur snapper like me is difficult – hopefully our editor can work some magic on the image – but I had to take a picture of Stephen Roche’s Motobecane upon which he won Stage 18a of the 1985 Tour de France. 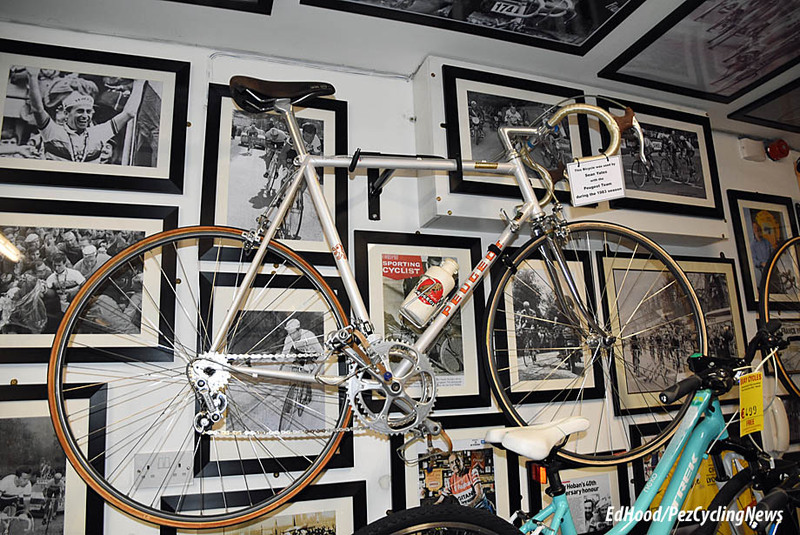 As with most of Austin’s exhibits, there’s a tale – the bike was rescued from Roche’s brother’s coal shed! 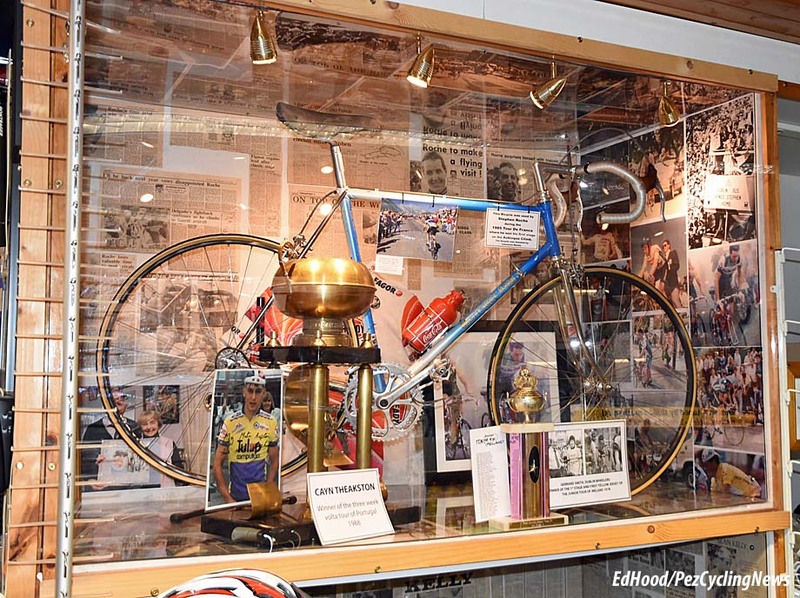 In the front of the case rests Cayn Theakston’s trophy for winning the 1988 Volta a Portugal; a 19 stage epic where the man from Worcester had to battle not only the other outfits but most of his own team to win. Ben McKenna is an Irish legend, he won the Ras way back in 1960 after having finished third then second in the previous two editions. 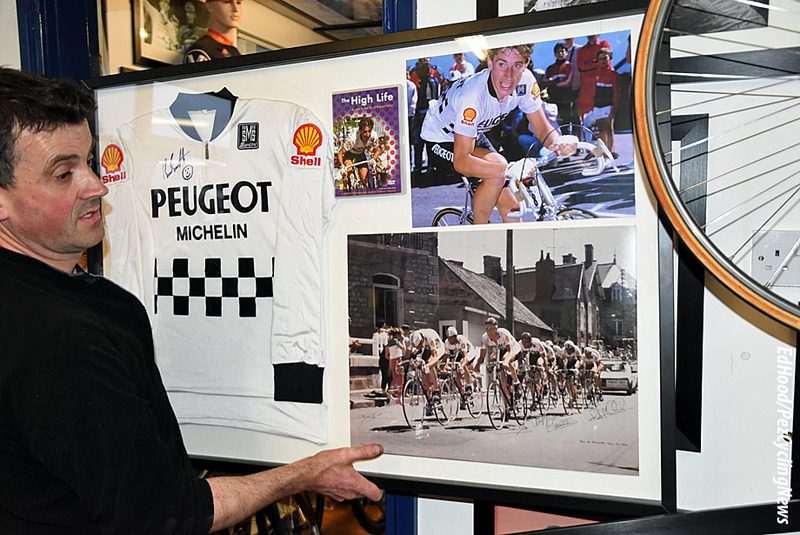 Here, Austin holds up McKenna’s jersey, in the background we have a Peugeot replica jersey signed by Barry Hoban and dedicated to the late Tom Simpson. The pink jersey is one of Damiano Cunego’s from his 2004 Giro d’Italia win – another tale. 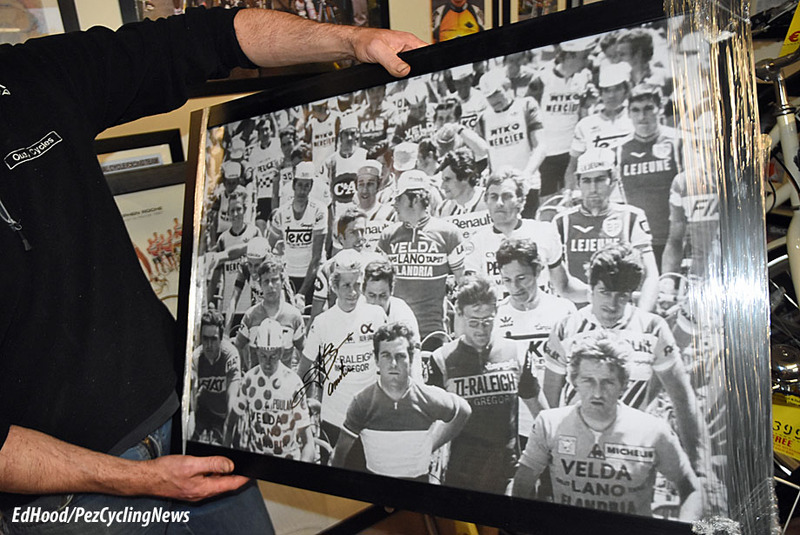 Barry Hoban was at a function in Italy, he was introduced to Cunego; the little Italian was so knocked out when he heard that the Englishman had won eight Tour stages, Vuelta stages and Ghent-Wevelgem that he autographed the jersey and gave it to Hoban. 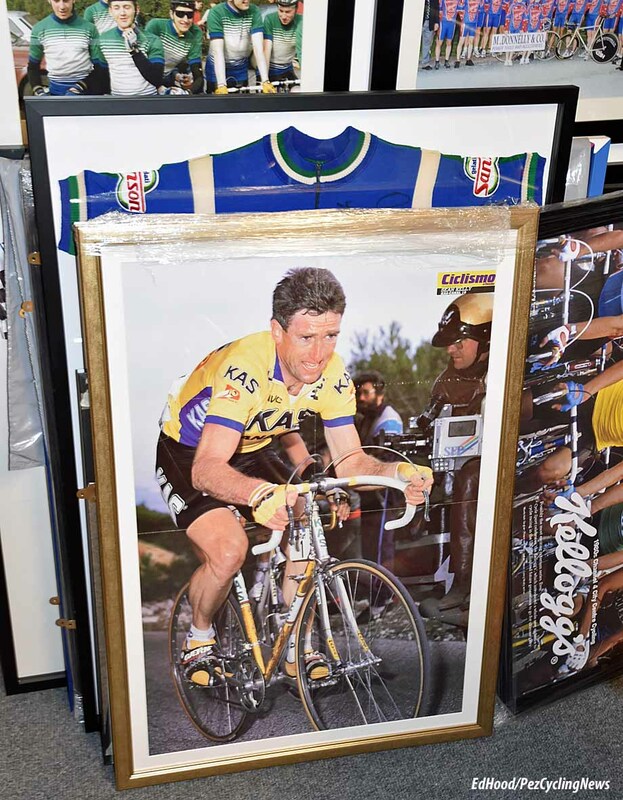 Sean Kelly is omnipresent in Quay Cycles; the trouble is that Austin has run out of wall space to hang pictures. Austin is always amazed and humbled by the patience of generosity of some of the world’s greatest riders. Back in 1993 ‘our’ Graeme Obree took the world by storm and commandeered the full front page of the world’s most famous sports daily newspaper, L’Equipe. ‘L’Encroyable Monsieur Obree’ read the headline after he broke ‘Campionissimmo’ Moser’s hour record. A simple request to Graeme saw him post off record certificates, signed photos and a jersey to Drogheda. Paul Watson is one of those that got away, hugely talented but perhaps not as focussed as he should have been; he came back to win the Worlds aged related road race championships but was unfortunately involved in an accident from which he’s still perhaps not fully recovered. 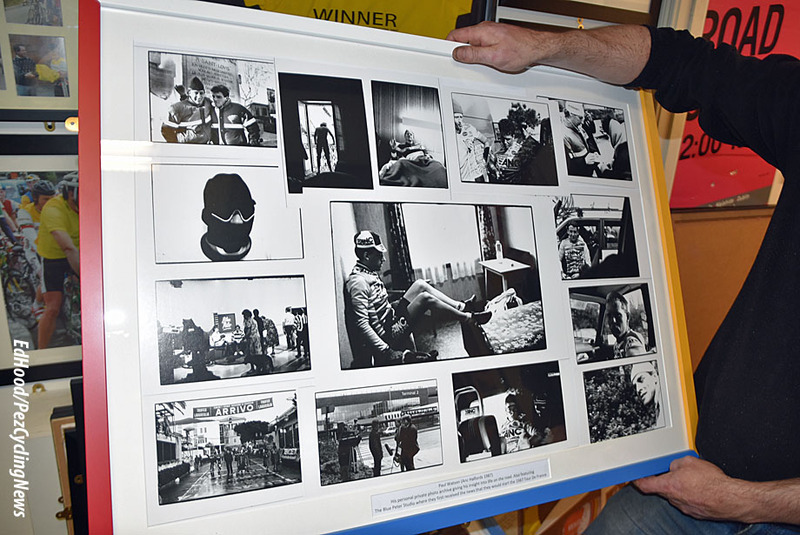 This is a collage of images from his days at ANC which he donated to Austin’s collection. 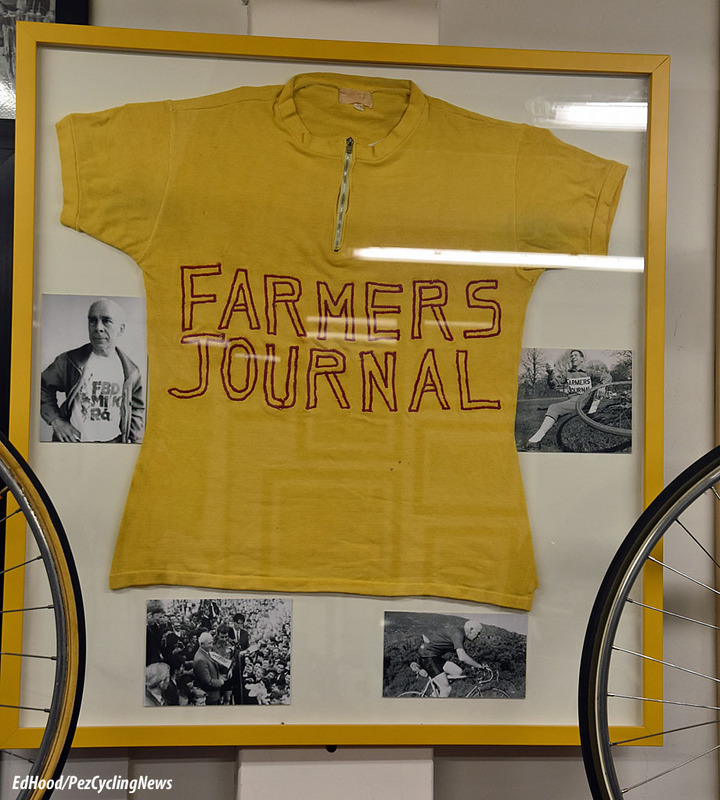 ‘Back in the day’ Castelli didn’t make the leader’s jerseys – this one was Ben McKenna’s from the Ras. The Rapparees were guerrilla fighters back in the Williamite War in Ireland of the late 1600’s and also the name chosen by cult frame builder Des Maye for his frames. Maye was one of very few Irish frame builders and ahead of his time when it came to building made to measure frames – his creations are now collectors’ pieces. It’s easy to brand Paul Kimmage as that journo guy who wrote the drugs book then had all the stuff with Lance. True; but he was also a very talented rider, taking sixth in the World Amateur Road Race Championship – and you don’t get a continental pro contract for four years because you’re not a good bike rider. 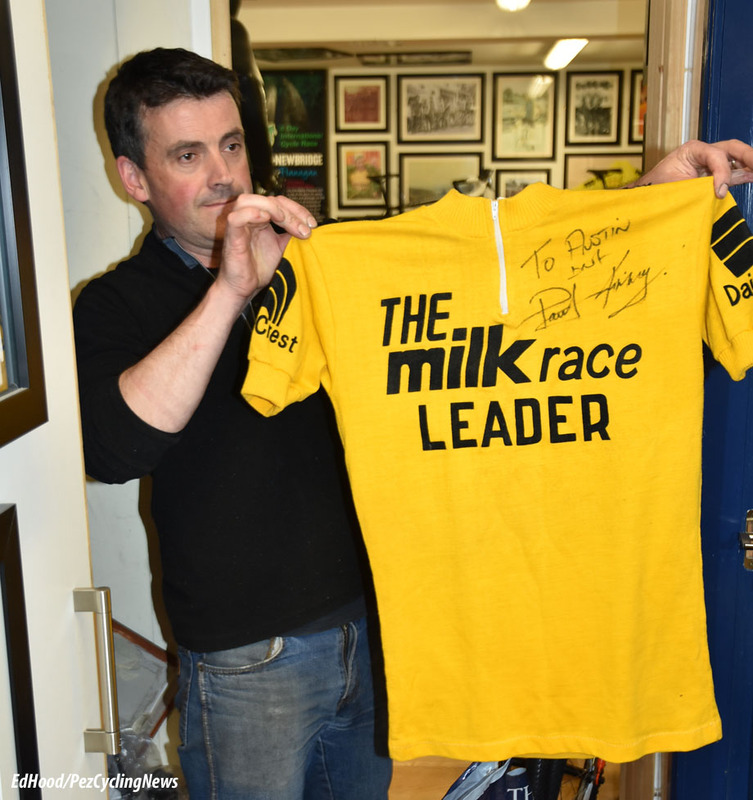 And one of his achievements that’s often over looked is that but for a mechanical he may well have won the 1983 Milk Race – he was in yellow deep into the race and gifted one of the coveted maillots to Austin. This is former World Cyclo-Cross Champion, Dominique Arnauld’s machine from his Castorama days. Although branded ‘Raleigh,’ these frames were actually built by the French Cyfac company as were the frames of Laurent Fignon, Thierry Marie, Thierry Clavreyolat, Charly Mottet, Marc Madiot, Richard Virenque and nearly every French pro from the 1980's to 2000's raced on a Cyfac painted in their team's livery. Through the decades they also built for more of the sport's legendary greats, including Chiapucci, Pantani, Vandenbroucke, Millar. . .
Austin doesn’t claim this is one of Kelly’s actual machines but it’s a very authentic replica; a gold anodised Duralinox 979 lugged and bonded aluminium frame with Mavic groupset – Kelly reckons he won 80% of his huge palmarès on one of these machines. Behind it, signed Kelly team jerseys and pictures of some of his best moments adorn the crammed wall. 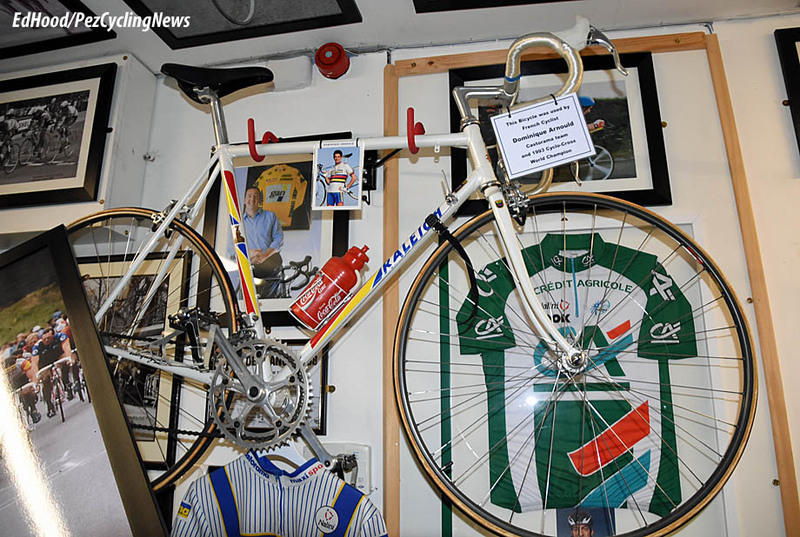 Stephen Roche never really got the chance to honour that beautiful jersey due to a knee injury – such a pity. Bernard Hinault, not a man to mess with and with a spiky reputation; so when Austin posted this famous image off - The Breton leading a riders’ strike to protest about the Tour organisers ever more extreme demands for ‘split’ stages - to Brittany he wasn’t convinced it would come back, but return it did, duly autographed - ‘The Badger’ must be mellowing with age. 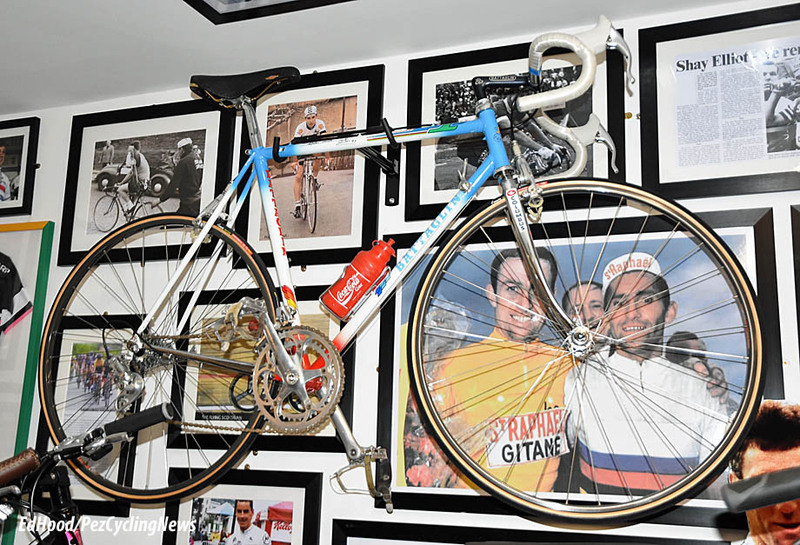 Another impeccable replica, this time of the bike Roche rode to glory in his wonderful 1987 ‘triptych’ of Giro, Tour and Worlds. Staring out through the spokes of the front wheel are 1962 World Champion, Jean Stablinski and silver medallist that year, Shay Elliot. Would Shay be smiling so readily if he knew that his ‘friend’ and godfather to his son, ‘Stab’ had paid off their breakaway companions to chase the Irishman down when he attacked? Sean Yates’ Peugeot (or it could just be an Emperor Sport?) for season 1983 displays the ‘Spidel’ groupset – Simplex gears, Stronglight chainset, Maillard chain and freewheel and Mafac (or should that be Modolo) side pull brakes? The Spidel groupset of all French components was put together to try to compete with Campagnolo and the rapidly growing Shimano menace. Needless to say, they didn’t succeed and Spidel is now a name just for eBay and sad folks like PEZ Euro Editor, Alastair and myself. 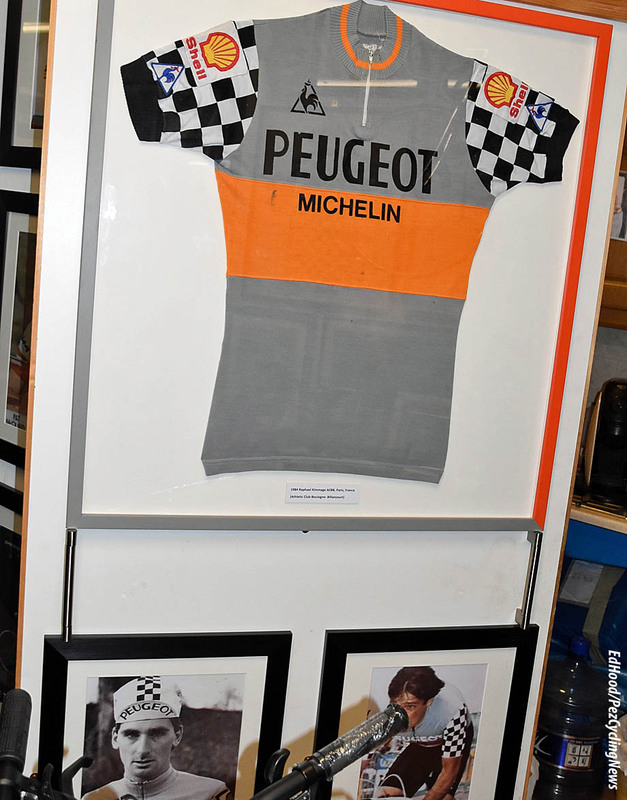 No autographs from Robert Millar but a nice Peugeot jersey dedicated by double ex-British Professional Champion, Brian Smith and some cool Peugeot pictures – would you want to be on Sean Yates’ wheel in that TTT? Me neither. Athletic Club de Boulogne-Billancourt perhaps the most famous amateur team ever? 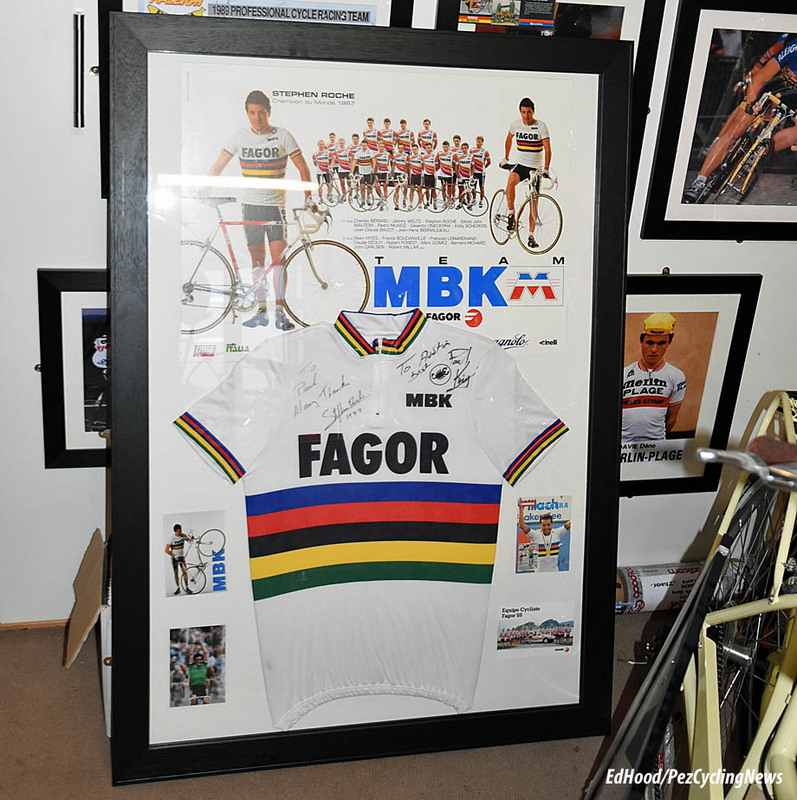 The jersey has been worn by some of the world’s best, including Stephen Roche, Phil Anderson, Robert Millar, Paul Kimmage, Sean Yates, Allan Peiper, Seamus Elliott, Jacques Boyer, Graham Jones, Jaan Kirsipuu, John Herety, and Paul Sherwen. 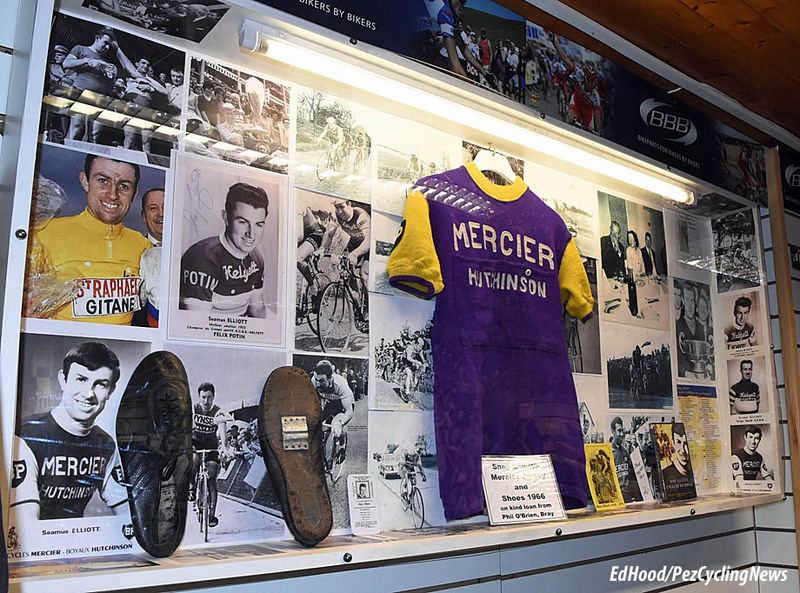 Images of Peiper and the late Peter Longbottom hang below the famous garment. In his Manchester Wheelers days, curator Austin raced alongside Longbottom; ‘a lovely man’ he remembers. In British time trial circles Longbottom will always be remembered as the man who broke ‘King Alf’ Engers record for the 25 mile time trial distance, shaving 11 seconds from Engers 49 minutes and 24 second ride. Cyril Cartwright is a name perhaps forgotten in the mists of time with some great performances over looked; like silver in the 1949 world amateur 4,000 metres pursuit championships or travelling for five weeks by sea to New Zealand to ride the Empire (now Commonwealth) Games where he won the 4,000 metres pursuit, beating Aussie great Russell Mockridge in the final. Cartwright was also Tom Simpson’s mentor when the young, future world road race champion was making a name for himself as a pursuiter. 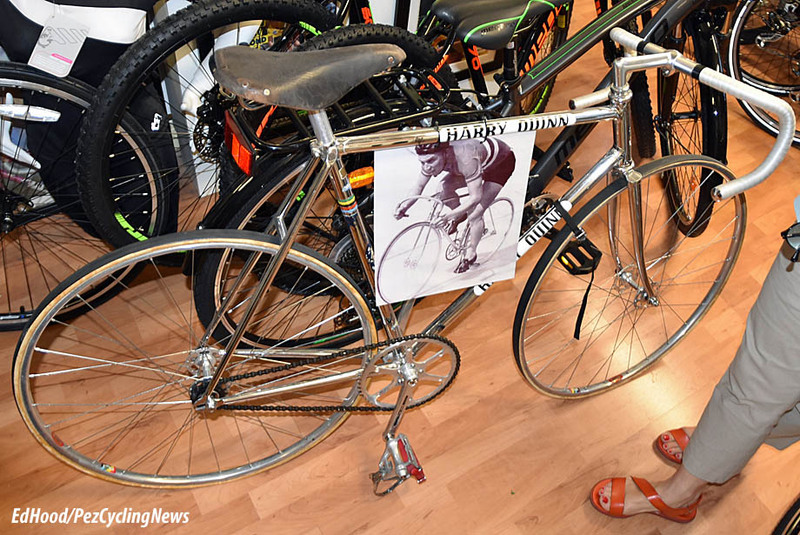 This is Cartwright’s Harry Quinn, albeit some of the equipment is of modern origin – but no doubt Austin will be losing sleep about how get some GB ‘bars and stem and a Chater Lea chainset for the chromium plated gem. 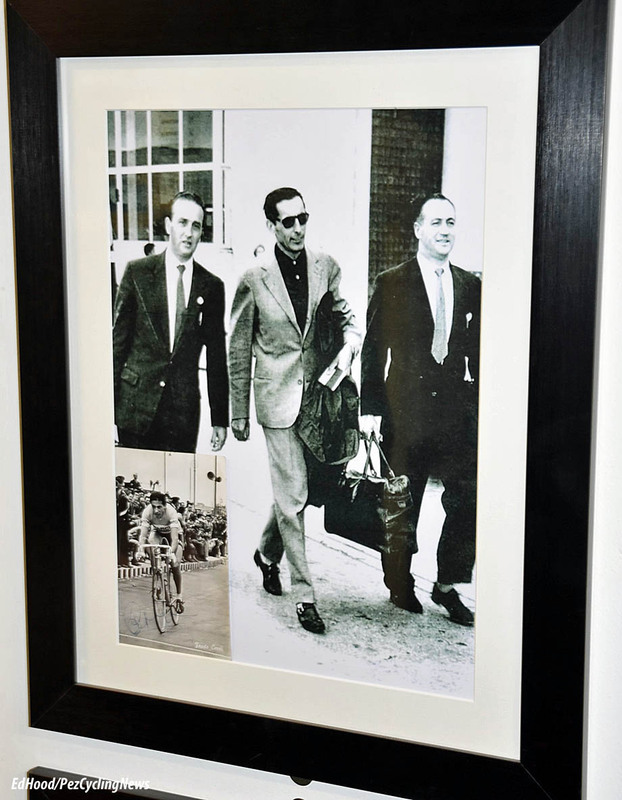 No collection is complete without reference to the Campionissimmo and this image is of the Italian Legend arriving in Ireland to ride a track meet, accompanied by Paul Kimmage’s father who organised the visit. Off the bike as well as on it, Coppi looks every inch the star. Austin hopes to have the collection ‘complete’ by the end of the year (he didn’t say which year though) – and his biggest worry? "The wife finding out what stuff really costs!" 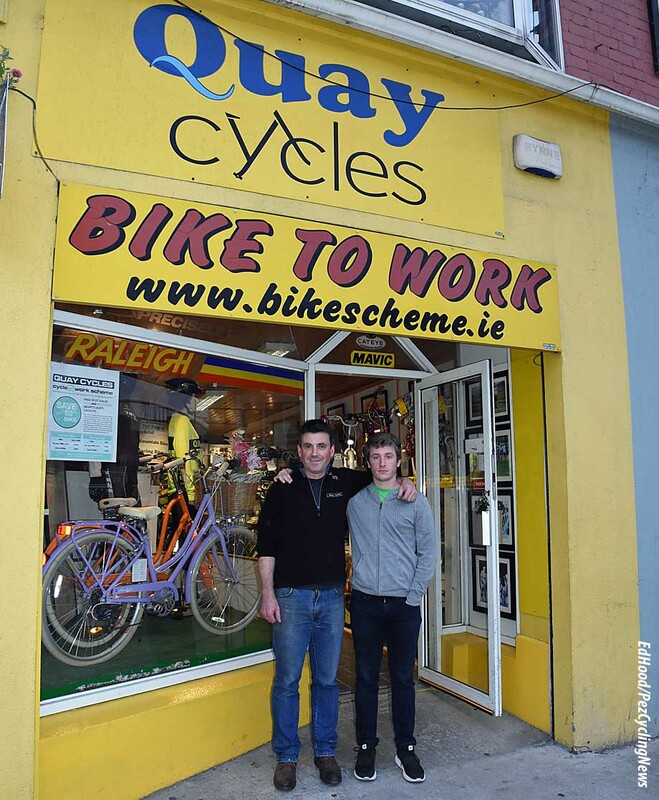 If you’re in Ireland, make your way to Drogheda and Quay Cycles, you’ll thank me.